At one of the first sf conventions I went to, Tom Shippey used the word “intergenrification” in conversation with Iain Banks and Iain M. Banks. It seemed to be a useful word, for the ways in which genres collide and intermingle with each other, or the way in which a text belongs to several genres at once. This may well have been one of those moments when we were getting all excited over slipstream — the genre of fiction of postmodern sensibility — that comes along every year or so. A decade or so later, people were getting excited about interstitial texts, texts which belonged to no genres, although its name suggests that these are texts between genres. Despite this being, frankly, arrant nonsense, I was recruited to write on this subject, “Between the ‘Deaths’ of Science Fiction: A Skeptical View of the Possibility for Anti-genres”. For that matter, my contribution to the Festschrift (bless you) for John Clute and Judith Clute considered the fluidity of genre boundaries at the heart of (John ) Clute’s project. I reviewed Gary Wolfe’s Evaporating Genres for Science Fiction Studies, with the sense that for Wolfe the genre had not so much evaporated as never solidified in the first place. And then, as part of a new module, Popular Genres and Popular Culture, I delivered a lecture on intergenrification I wanted to talk about the way in which the sitcom has overlaps with docusoap and fly on the wall documentaries and game shows and chatshows and I googled the word “intergenrification“. It gives two results. The second is to a PDF, which apparently includes the quotation, “It may be the case that intergenrification is a staple of postmodernist literature, but there may be other readings of the novel.” Ah, a believer in PoMo, I presume. The first is to something I wrote, “Thirteen Ways of Looking at the British Boom“, my Pioneer Award-winning article: “As Steve Jeffery wrote in his review: ‘Levy’s debut is assured but tries perhaps too hard … to be too many things at once: sf thriller, fantasy, dystopia and romance’ (Jeffery 28). This intergenrification is typical, however, of the British Boom.” See how I use the word, confidently assuming that people will know what I mean? I did some hunting around for my JFA piece, but failed to find a file on this computer and or online, although there is a book that does at least cite it. Butler, Bakhtin, Derrida. Not bad company. It looks as though, should the word ever make it into the OED, I’ve got dibs along with the other chap on the citation quotation – and, believe me, I checked for the entry. It was only today that I’ve clicked on the other link, and discovered it’s a PDF of my PHD and presumably vaguely official. Who knew it was out there? We hold these truths to be self evident: i) no genre is ever pure, ii) no text ever belongs to a single genre, iii) no text is genreless. Our justification for the latter two truths comes in part from the essay by Jacques Derrida called “The Law of Genre” (1979). “As soon as the word genre is sounded,” he writes, “as soon as it is heard, as soon as one attempts to conceive it, a limit is drawn. And when a limit is established, norms and interdictions are not far behind” (224). But that limit is already transgressed. The law of genres is that genres are not to be mixed – but the law of the law of genre is that genres are contaminated, impure or parasitical. Individual texts overflow the boundaries, become larger than their limitations, transcend their classes. Derrida advances the thesis that a text does “not belong to any genre. Every text participates in one or several genres, there is no genreless text, there is always a genre and genres, yet such participation never amounts to belonging” (230). And, lest we forget, Brian Aldiss reached a similar point two decades earlier in a review: ‘[T]here is no sf novel that is purely an sf novel. At some stage all sf novels turn into something else’ (Aldiss, Brian (1964) ‘[Review of] Judgement at Jonbar’, S. F. Horizons 1: 22.). This is not just the case for sf novels. But, obviously, if Professor Shippey wrote something down, I’d certainly admit priority to seniority. Aldiss, Brian (1964) [Review of] Judgement at Jonbar, S. F. Horizons 1. Butler, Andrew M. (2003) “Thirteen Ways of Looking at the British Boom”, Science Fiction Studies 30(3). Butler, Andrew M. (2004) “Between the ‘Deaths’ of Science Fiction: A Skeptical View of the Possibility for Anti-genres”, Journal of the Fantastic in the Arts 15(3), pp. 208-216. 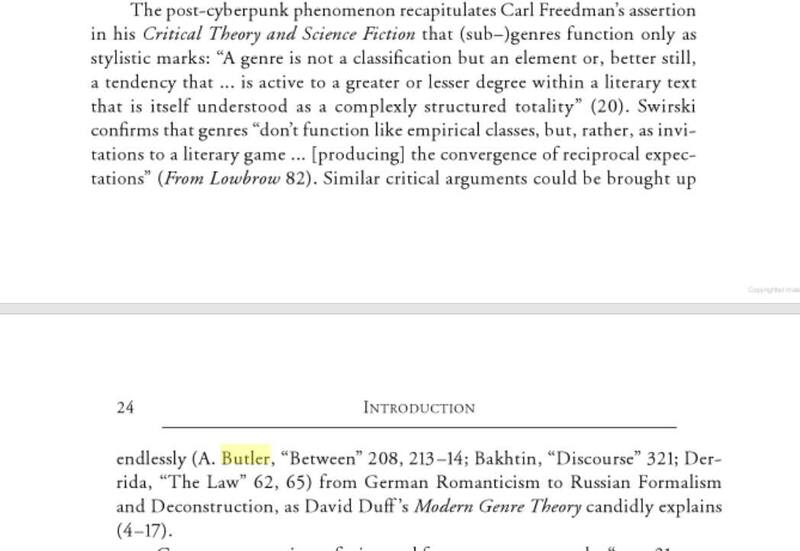 Butler, Andrew M. (2012) Review of Evaporating Genres: Essays on Fantastic Literature, Science Fiction Studies 39(1), pp. 155-158. Derrida, Jacques (1979) “The Law of Genre”, Critical Inquiry 7(1), pp. 55-81.